The fountain was created by the architect, Nicola Salvi, in 1732 under Pope Clemente XII who continued the work begun by Bernini approximately one hundred years before. The fountain symbolizes the legend of how water was first brought to Rome in 19 BC when Agrippa decided to build a canal. The canal was called "Acqua Vergine" meaning virgin water, because as the legend goes, Agrippa's soldiers, looking for water in the country, met a young virgin who led them to this source of pure water. In fact, the predominant theme of this fountain is the sea. A triumphal arch, surmounted by an attic story with the coat of arms of Clement XII Corsini, is in the middle. The statue of "Ocean", by Pietro Bracci rises on a rocky base in the center above a conch shell-shaped cart pulled by two sea horses guided by Triton. The horses represent both the agitated and calm sea, while the two statues, on the sides of the statue Ocean, represent Health and Prosperity. and the legend of the Virgin who indicated the spring to the Romans. The arch of the Palace of Neptune and the statue of Neptune dominate the fountain in the center where Neptune rides in a chariot drawn by two sea horses and two tritons. The niche on the left contains the statue of Abundance with Agrippa portrayed above, approving the plans for the aqueduct. The niche on the right contains the statue of Salubrity, above which is a relief of the virgin leading the soldiers the way. Inaugurated in 1735, after 23 years of construction, is the only antique Roman aqueduct whose use has remained uninterrupted since the time of Augustus up to today. 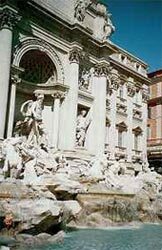 It is the most noted Roman fountain and the most famous in the world for its monumental stage-set quality. The most monumental fountain in Rome, and perhaps the world, is famous for the legend that whoever drinks from it or throws a coin in the fountain, will surely return to Rome.